With Microsoft's decision to pull the classic start menu from the upcoming Windows 8 operating system, came a rise of third party solutions to bring back the start menu. We already mentioned that ViStart can add the start menu back to the operating system. The latest company to announce a free start menu program for Windows 8 is Stardock. 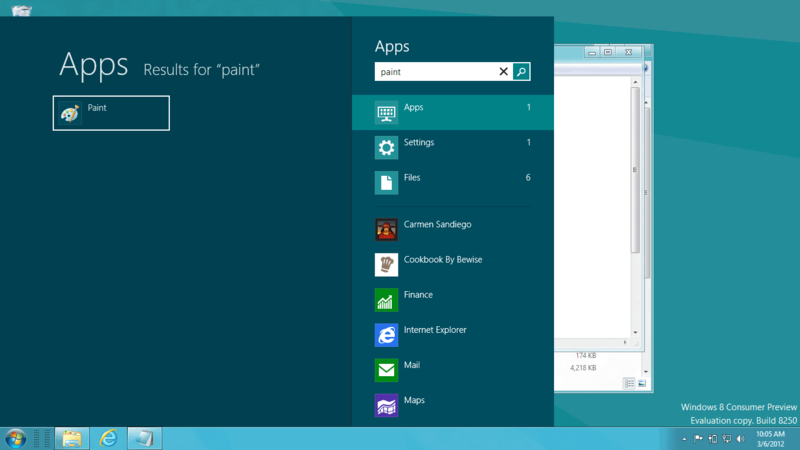 Start8, which will be available later this week, adds a start menu back to the Windows 8 desktop. The program has just been announced on the official website. 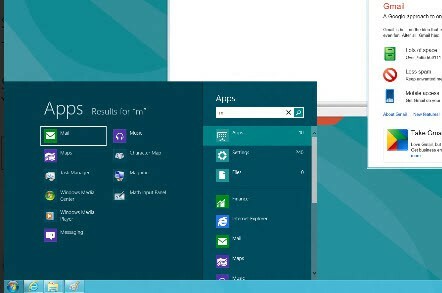 Judging from the screenshot, Stardock's solution copies the Metro search and application launch interface to the desktop. At least the design looks exactly like the Metro Search page layout. According to the product page, the start menu allows you to search for and load applications without switching to Metro first. 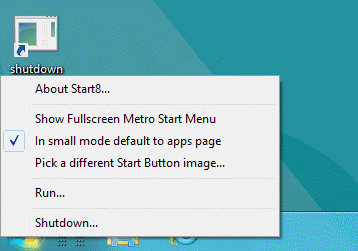 Stardock in addition has added run and shutdown options to the start menu orb. Start8 is only compatible with the Windows 8 Consumer Preview right now. Stardock will however update the program to make it compatible with the soon to be released release candidate and final versions of the operating system. It is too early to tell if this start menu concept will convince Windows 8 users, or if they prefer to install a traditional start menu instead. Windows 8 users who'd like to be informed when the first version of Start8 gets released can enter their email address on the official website. As I said earlier, it is not necessary considering that the program will be out in the coming days. Just check back on the Stardock website or here on Ghacks, and you can be sure that you won't miss the release. Update: I just received the download link and have installed the program in the Windows 8 Consumer Preview. The start orb gets automatically added in the right spot during installation. When you click on the orb, you get a Metro like interface that displays your apps there and the search. It replicates the Metro search options. You can start typing right away to find apps, or click on one to open it directly. A right-click opens a context menu with options to run applications or shutdown the computer. The interface is as responsive as the Metro UI interface when it comes to searching and starting applications. Interested users can download the program from this location. since i dont like metro at all, the vistart-menu does better fit my needs. I tried this it basically wrecked the VM I had win8 preview in. After installing I couldn’t use the menu bar anymore. You could try the restore / reset feature of Windows 8. I am anticipating an profluent avalanche of such apps for Window 8. Well with the all new look of Windows 8 maybe now is the time for some of the Linux distro’s to push hard for market share. since anyone who switches to windows 8 will have to get used to a new interface anyway. The implementation of this is actually pretty simple, as what you see *is* the Start Page and Search Charm from the Metro UI. The program waits for Start to be invoked and then re-sizes and re-positions the Metro window. Metro still uses windows as containers just like any Win32 application (WinRT is hosted on top of Win32, don’t forget) – Microsoft has forced them to be full-screen, but that can be changed. Assuming they don’t block this technique in the final release, Stardock or someone else ought to be able to build a true ‘Desktop Mode’ for Windows 8 where Metro apps run windowed on the desktop rather than the other way around. Which is exactly what we need for large-screen desktop PCs. Although it looks horrible with Windows 8, Vista Start Menu gave me access to everything available in Windows 8 with a simple click. No orb–too bad. Vi Start wasn’t too bad, but when I restarted the VMware, it was located somewhere which took some time to figure out. The scheme doesn’t really match the Metro style. However, with Vi Start installed, I was able to install Stardock’s Tiles and Object Dock which made a few programs easier to fine. I like Start 8, but it is sooooo big with no option to make the menu items smaller. All this seems more like a step toward catering to a Windows tablet. I really, really like EasyPeasy’s UI–Ubuntu okay, but EasyPeasy is so natural. I’m somewhat disappointed more developers haven’t followed its simplicity. Tiles with Start 8 makes for a usable desktop. Sorry about the guy who installed Start 8 and had VM crash; didn’t happen (yet) here. A one click shutdown (takes 4 in the Consumer preview). Here’s a Classic Shell skin: http://www.askvg.com/download-classic-shell-skin-to-get-windows-7-look-like-start-menu-and-start-button-in-windows-8/ to make it look like the Windows 7 Start Menu. The Start Menu is THE reason I’m debating upgrading to Windows 8 for the $40 price. I have not played with Windows previews at all personally, but done a lot of reading and see both Start8 and ViStart mentioned many places. It does look like Start8 has updated theirs to now offer (and even now defaults to) an option for a Windows 7 style Start Menu. I would like to see a side by side evaluation of Start8 and ViStart from a standpoint of which one gives you the experience most closely to the full Windows 7 Start Menu experience. Then it would also be nice to know what they each offer on top of that. One thing I read somewhere else about one of them (not shure where I read it or about which program) is that while it LOOKED like the Windows 7 Start Menu, it did not support drag-and-drop reorganizing within the Start Menu nor did it support the right-click context menu. (You’d right-click and nothing happened.) And I’d still want to be able to customize the links on the right side of the menu where the links to Documents, Pictures, Music, etc. are. So it’s be nice to see a review of current versions to see if these things work. I am running Windows 8 on a separate HD, installed Start8 works very well, leave it to Stardock to fix something that Microsoft broke!